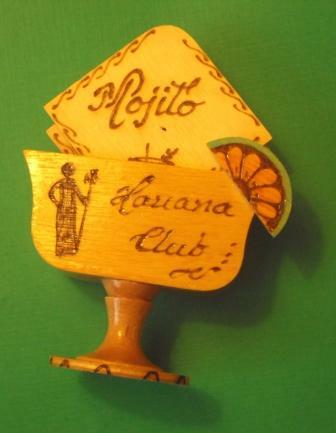 Here is a Cuban mojito recipe taken from a set of souvenir coasters. The Mojito comes to us from Cuba. It is made of five ingredients, including yerba buena, which is spearmint. You can substitute mint leaves. The preparation is to gently press the mint leaves into the lime juice and sugar or cane juice (guarapo). Then add white rum and stir. Top with ice and club soda. 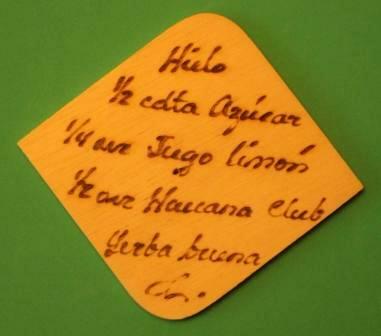 American author Ernest Hemingway enjoyed drinking Mojitos at La Bodeguita del Medio Bar in Old Havana. The terrace at the back of the Hotel Nacional is a perfect place to sip a Mojito. While the guitarists play and the ocean laps gently below the bluff, guests dream of a gentler time. The sweetness of the rum with cane sugar mingles with crushed mint to refresh the palate.